If you’re getting cash back this year from filing your income taxes, hold off on booking those plane tickets. There are ways to get the most ‘bang’ for your refund bucks. If you spend your RRSP refund… you unknowingly end up investing less than you started with, and less than most think. If you spend your RRSP refund, you are converting dollars that have already been taxed into RRSP dollars that will be taxed again later when you withdraw the funds. Many people mistakenly think that if they put $3,000 in their RRSP and spend their refund, they’ve added $3,000 to their retirement fund. But if you’re in a 40% tax bracket and spend the $1,200 refund, you’ve only invested $1,800 of the $3,000 you started with. And if you reinvest that $1,200, you’ve already contributed $4,200. Attack those high-interest debts first. Credit cards and unsecured credit lines can charge interest ranging from 6 to 21% and can be a real strain on cash flow, preventing you from getting ahead. With credit cards typically charging 19 to 21% on unpaid balances, you are unlikely to find an investment that will guarantee you a higher return to justify investing rather than paying off debt. This isn’t necessarily for everyone, but there are good reasons to consider making a lump-sum payment. Even though mortgage rates are very low, we know they will go up eventually. By putting a lump sum down on the mortgage now, the payments when you renew the mortgage may still be manageable. Using your tax return to pay down your mortgage will not only give you a guaranteed rate of return, but it will also ensure that you’re mortgage-free sooner and save you thousands in interest over the life of your mortgage. If your income is currently below where you project it to be at retirement, you may want to look at maximizing your TFSA. Similar to an RRSP, this account allows you to earn investment returns tax free. 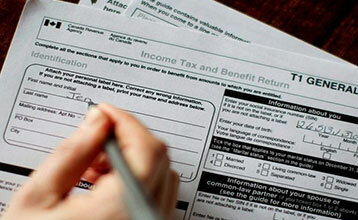 Although you receive no tax deductions, you are consequently not taxed on withdrawals. Not having any contribution room left for an RRSP is another argument for contributing toward a TFSA. If you have children, keep in mind just how costly their post-secondary education is going to be. By catching up on RESP (Registered Education Savings Plan) contributions, you can receive up to a 20% matching contribution from the Canadian Government in the form of a Canadian Education Savings Grant. That’s an impressive rate of return on investment without taking any risk. Another option is to spend the funds on your own education as a means to improve your skill set and move up the ladder or transition to another career altogether. It can be hard to see the benefits of this investment, but it’s worth remembering that anything can happen. Life insurance is essential, especially for young families. You need to cover your debts and protect from loss of income to ensure the well-being of surviving family members. Even though life insurance can be inexpensive, some young families have a difficult time finding the cash flow to pay for it. Using a tax refund to fund the annual premiums can be a way to not affect day-to-day living expenses but still ensure you and your family are protected in the event of premature death.